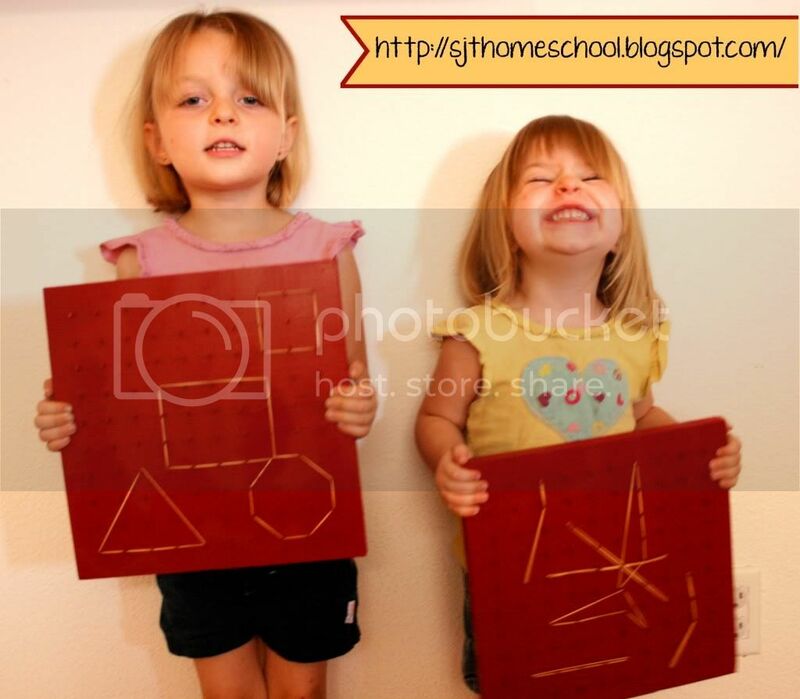 I used to love playing with geoboards when I was a kid and I wanted to get a couple for the girls to play with in the classroom. If you follow my other blog you know that there is no way I am going to buy something if I think I can make it for a lot cheaper. Well, these geoboards were no exception. We had some scrap wood in the garage that I cut into squares. These are 11in. by 11in. but you could use any size you wish. (Could you imagine a giant one hanging on the wall!! How fun!). I started out by making vertical lines 1 inch apart and then did the same horizontally. After all of the lines were drawn I hammered a nail into each cross section. 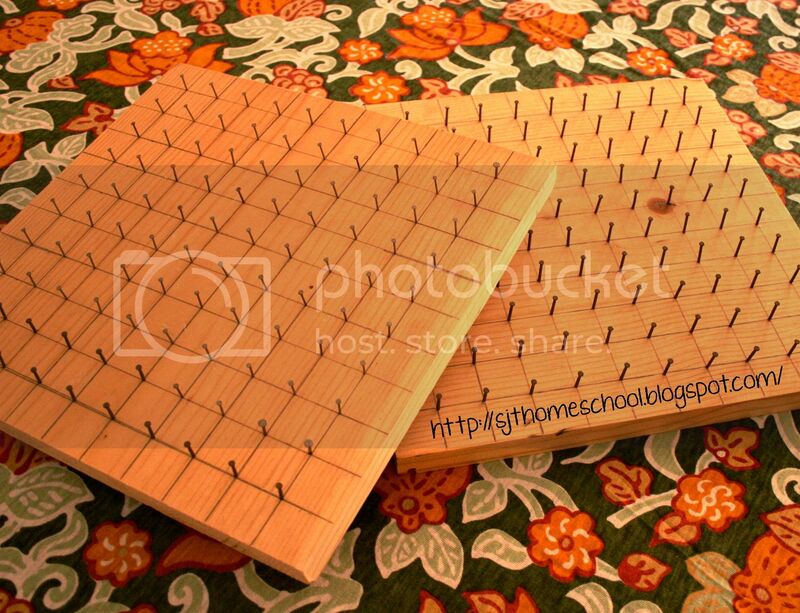 On each one of these boards there are 100 nails (200 total!!) It may seem like a lot but I think I only spent around 30 minutes on the nails. If you are using really small nails and your not that great with a hammer you could always use a clothes pin to hold the nail in place and avoid smashing a finger. Once all the nails were in, I took them outside and gave them two coats of red spray paint. This project took about two hours to complete (that includes drying time. It took only about 30 minutes for the paint to dry in this heat) and cost me nothing since I already had the supplies on hand. They turned out perfect and the girls love them. I am sure that these will get a lot of use in our classroom. What a great idea! I don't think I'd have the patience to nail that many nails though LOL! Thanks for sharing on Hey Mom, Look What I Did at Adventures In Mommy Land!! This is such a great idea. I would love to do this with my kids. Maybe I'll get my husband to do it. He'd probably love this project. Thanks for the idea. This is such a great idea, I will have to share it with the preschool director at my work! She will probably have me make a bunch of them lol! Thanks so much for sharing and I am a new follower!! Thank you for stopping by. I am so glad you enjoyed my post. If you are making a bunch of them I would suggest using fewer nails. 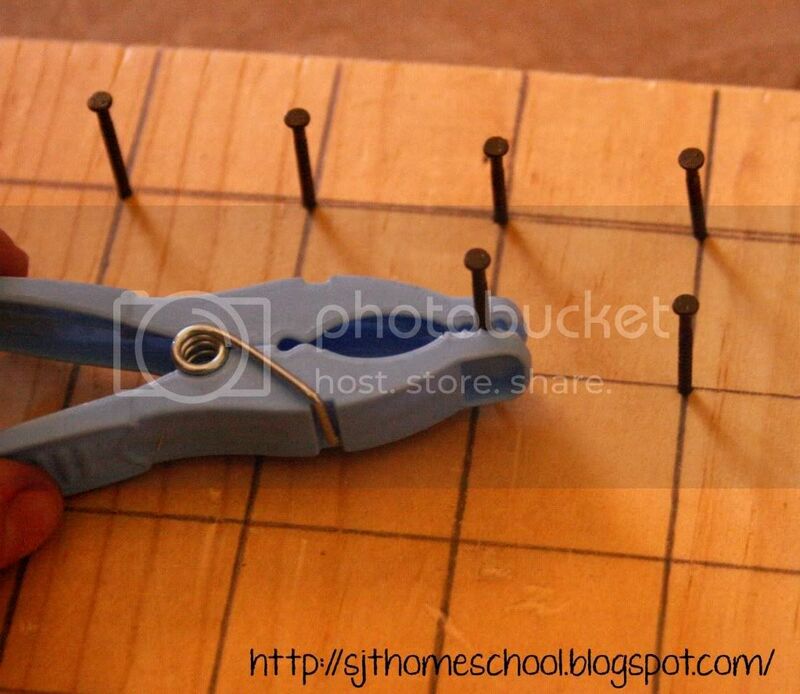 You could also use pushpins but I would put some glue on the pin before pushing it into the wood to help it hold. How awesome! I love geoboards! We would love to invite you to join us on Saturday Show & Tell on Cheerios and Lattes! I know my readers will love all your kid friendly ideas, as many are homeschoolers and teaching mamas also ! Have a great weekend! Over the years I have found the individual geo boards are one hard to come by and two they can be very pricey. 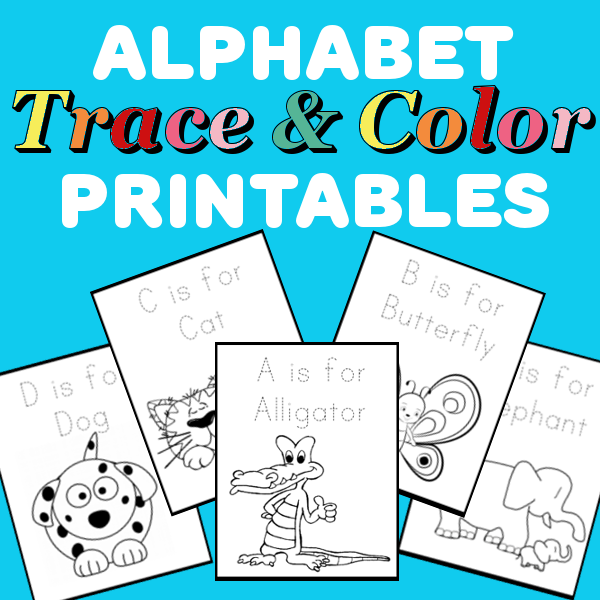 This is a fantastic DIY that not only saves money but also I love the fact that you can personalize the board to your child (in color choices). I have pinned this onto my Pinterest Board. Thank you for linking up this week to my Enchanted Thursdays Blog Hop. I hope to see you again next week! I am a new follower! Thanks for linking up to Thinky Linky Thursday!